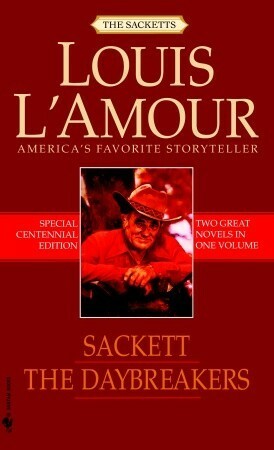 Sackett is the ninth book in The Sacketts series by Louis L'Amour. Available at Amazon, Barnes and Noble, and BooksAMillion. One of the most popular fictional creations of our time, the chronicle of the Sackett family is also one of Louis L’Amour’s crowning achievements—and these two magnificent novels are proof. A drifter by circumstance, William Tell Sackett hungered for a place he couldn’t name but knew he had to find. South of the Tetons, through a keyhole pass, he found it: a lonely yet beautiful valley—with a fortune in gold. Then he found an even greater treasure: Ange Kerry, a courageous and resourceful woman. But the harsh ways it takes to protect his claim—and their lives—may be the one thing that drives Ange away. The story meanders and could have been edited/cleaned up for a faster-paced read but that wasn't L'Amour's style and, in the end, the meandering contributes to the theme of wandering cowpoke. L'Amour surprises me with his female characters, with both Drusilla Alvarado and Laura Pitts, because he throws in some subtle gender role reversals. And something else that isn't said very often about L'Amour - here's a story featuring a Mexican immigrant marrying a white boy from Tennessee. And some racism drives the plot forward but the racism comes from the bad guys. I know L'Amour is often criticized for using stereotypical ethnic tropes, particularly in regards to Native Americans, but I know there's a big difference between a Hollywood Indian and a real Native American and I expect other readers, with exception to the very young, to also know the difference. L'Amour played with the tools of the trade that were available to him. He wrote these books in a time when ethnicity wasn't emphasized (or sometimes erased) by the arts industry and L'Amour still finds small ways to work in real information about Native Americans (in The Daybreakers, he works in the correct way to say Nez Perce, "Nay Persay"; I'm reading forward, and in End of the Drive, he works in the correct way to use the Lakota greeting hau kola, "how kola"). So I think L'Amour may have played a role in helping to break those stereotypes. And, in a way, he preserves some of the atrocities that have been done to ethnic groups. I've encountered William Tell Sackett in a few of L'Amour's short stories and I liked him for his introversion. But, in this story, Tell makes it a point to mention his sloped shoulders repeatedly so I imagined Ryan Gosling playing him. Take that as you will; I'm not a Gosling fangirl and would have preferred to imagine Benedict Cumberbatch -with added muscles- as Tell. I didn't like the main female character, Ange, or her morally superior attitude. I might have even hoped she'd fall off the mountain before the book was over. She didn't. Which brings me to my biggest problem with the book - the mountain itself. Early in the story, L'Amour painted one side of the mountain as a cliff that Tell avoided, even though his newly-founded town is down below, because the steep slopes hindered descent. Then, Tell made his final descent down those slopes and I had to re-imagine the mountain, which I had problems doing because, up until the end of the book, the imagery is one of the strong points of the story. The re-imagined imagery at the end of the book just didn't work for me. Add to it, I felt cheated by L'Amour's use of Mother Nature as a deus ex machina at the end of the book. He abandoned the bad guys for an easy out. I wanted to see Tell face down the villains (isn't that the promise of a western?). I enjoyed the first half of the story and wish L'Amour had given Sackett the ending that it deserved.